Many of the people who attend are responsible for employee training at their respective community-based social-service agency. Information gained at this conference will not only impact the attendee but others they are responsible for training. Others who attend are individuals who are aging with a developmental disability and/or their loved ones, who are seeking information on how best to remain independent as they go through end-of-life stages. There are specific tracks targeted at different audiences that will attend (i.e. medical, direct care, self-advocacy). All tracks have the common thread of improving quality of life and helping maintain the independence of aging individuals with developmental disabilities with the broad goal of keeping people in their homes. "Information overall was great! I liked networking with other professionals in the ID/DD industry and learning info on the aging population." "Topics were on target with the clients that I work with and information provided was informational and helpful." 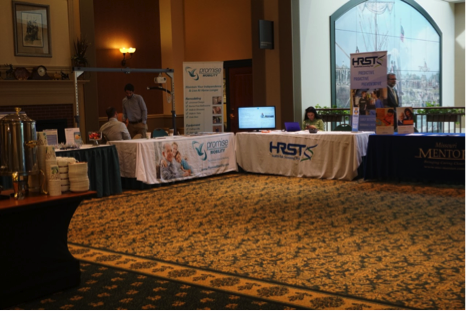 "Presenters were very knowledgeable & topics were good!" 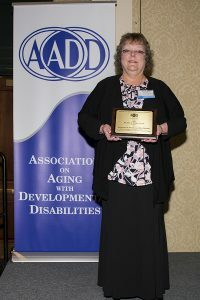 The Allene M. Jackson Award, originated in 2003, named after AADD's founding Executive Director, Allene M. Jackson, who led the agency from 1989 to 1995. This award is given to a direct care staff who have demonstrated a commitment to excellence in their work with a person or persons who are at least 50 years of age and have a developmental disability. 2017 marked the 15th anniversary of presenting this award. 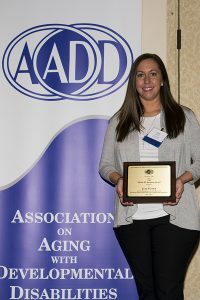 AADD commends our past award winners for their commitment to the field of aging with developmental disabilities. The Dr. John E. Morley Award, originated in 2017, is named after the inaugural recipient, Dr. John E. Morley. Dr. Morley is one of the nation's foremost authorities on geriatrics, receiving his medical degree from University of the Witwatersrand. Since 1989, he has been a Dammert Professor of Gerontology and Director for the Division of Geriatric Medicine, Department of Internal Medicine at Saint Louis University Medical Center. He has also been the Director of the Division of Endocrinology at Saint Louis University Medical Center since 2006. The Dr. John E. Morley award is given in honor of individuals who show commitment and leadership in reducing barriers and/or creating new opportunities for persons who are at least 50 years of age and have a developmental disability. Eligible recipients are doctors, nurses, social workers, administrators, and management professionals who have followed in Dr. Morley’s path in opening doors for this population.